This is the second part of a portrait about James Feaste. Part 1 concentrates on the capture and subsequent trial of the smuggler. Here, we look into the network he created, the pressures it put on the government of the day, and evidence that suggests James Feaste didn’t simply sail away on an English Man-of-War to some unnamed ‘foreign station’. James Feaste spent a good part of his life waiting in the shadows for his next group of guests to arrive. He would lead them along the lesser-known country lanes of North Kent with their high-banked hedgerows and convenient tracks leading to temporary camps like the one at Convict’s Wood. Along this lattice-work of lanes an escape party could find an isolated farm or head for the hazardous marshes and the well-disguised hides used by the fowlers. These were the surroundings that were safest for James Feaste. Nearly every government agent in the country was looking for him and in particular one man, Sir Thomas Mantell. Six times mayor of Dover from 1795 onwards, Mantell was a surgeon who gave up his scalpel to become the Government Agent for the exchange of Prisoners of War at Dover. He was the one man in the country who knew Feaste well, all his life in fact. The pursuit of Feaste had been gathering momentum over the years. 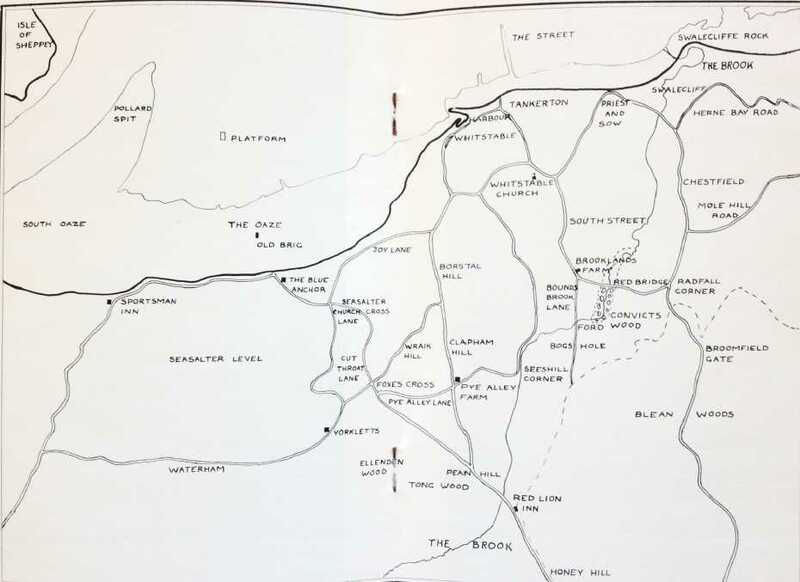 He became one of the most wanted men in the country but James Feaste was resourceful with an intricate network covering the whole country, including the remote areas of North Kent. Whitstable had become one of his preferred departure points for continental Europe. But one event was to change all that. On March 22nd and 23rd, 1810, Feaste organised the escape of two important prisoners. These high-ranking prisoners were General Pillet, Adjutant Commandant Chef de l’Etat – Major of the First Division of the Army of Portugal and Commander Paolucci of Friedland. It was an escape that the British authorities could not tolerate. At this time Feaste was using the name, Captain Thomas Harman. Captain Harman had arranged a complex escape route for his VIPs starting from Alresford where the prisoners were confined. Even though Harman had reassured his charges that they would be safely in France within 36 hours, General Pillet threatened to give himself up to the local mayor after hiding for four days in the house of a one-eyed woman named Mrs Ackers. The two men were moved to another local house of Mr Paine who struggled to keep control over the situation. The prisoners were offered the disguise of two British sailors and the company of two women but proudly refused to disguise themselves in such common clothes. As they left to meet the two women the prisoners were surrounded and arrested. While all this was happening Captain Thomas Harman had been keeping himself discreetly out of sight at a well-known smuggler’s inn, three miles away. But he was soon arrested and charged. Harman protested his innocence, insisting that he thought the two men were Guernsey lace merchants. Pillet and Paolucci were transferred to the notorious Norman Cross depot and Harman was put in Horsham jail. Captain Harman tried to charm and talk his way out of trouble. He offered officials inside information about the escape business but it was declined and he was sent to serve in the Navy. After initially serving on HMS Enterprise, Harman was then ordered to the 90-gun Namur moored near the Nore sandbank in the Thames Estuary. Its duties were to guard against smugglers and spies from the Continent and it is not too difficult to realise that this work suited Captain Harman. He was on familiar ground and making valuable contacts and connections. Although he favoured Whitstable in his planning – especially the Seasalter area because of its remote marshes, woodlands and farms – James Feaste operated on a national scale with a well-informed intelligence network working throughout the country. He would know about the possibility of a high ranking prisoner’s desire to escape or learn about a family willing to pay a handsome fee for an escape – wherever the prisoner was incarcerated. The most common route for smuggling prisoners was via London towards the coast by road or sea. The usual plan was to make for Canterbury, Dover or some remote place on the North Kent coast before waiting for a clear night when they would embark on a vessel for the continent. It is quite probable that Feaste aka Thomas Harman made use of the secretive Seasalter Company as part of his network and would certainly have found reassurances in their ability to remain discrete and invisible. But his plans were on a much larger scale. They covered the whole country. And he had the skills and talents to make them work. It was the question that everyone asked and the one question that made capturing this smuggler so difficult. As we saw in the first part of the profile, James Feaste (AKA James Moore AKA Captain Thomas Harman AKA Thomas Feaste Moore AKA Thomas Maitland AKA Thomas Herbert AKA Theodore Eugene Feaste) was a man who was hard to get to know. Yet he was charming, educated, fluent in French and wealthy without being flamboyant. James Feaste claimed, later in life, to have been born at Fordwich near Canterbury on 12 August 1788. His name at this stage was James Moore but throughout this profile we have used ‘Feaste’ because this is the name he was finally prosecuted under. Arriving as James Moore in Whitstable and probably 20 year’s old, he promptly bought a hoy which was classed as a Smack of 13 tons. 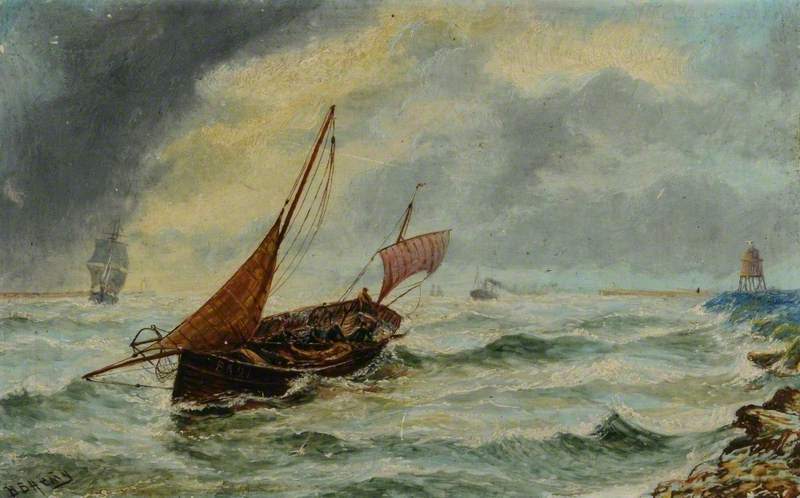 Moore used this vessel to transfer escaped prisoners from London to Seasalter. The business flourished and he purchased a second vessel, the Two Sisters, which was a much larger craft used to cross to the Continent and so complete the final stage of an escape route. The historian Wallace Harvey says that it is truly remarkable how this man succeeded in building a national network and influential friends in high places on both sides of the channel. As business flourished, Theodore buys another smack called The Elizabeth of 16 tons. Within weeks of his marriage a restless Theodore Eugene Feaste is sailing back and forth to London on his hoy, The Whitstable. Various accounts show how his business focused mainly on the richer prisoners-of-war and as we saw in the first part of this portrait, it was this concentration on high profile prisoners that was to be Feaste’s downfall. He became too visible for the authorities to ignore – even with the influence and help of powerful friends. A stranger was seen furtively carrying a trunk to the Cross Keys Inn and from there he travelled by post-chaise to Lauder. Frequent escapes in the area had alerted the government Agent and the suspicious behaviour of the stranger resulted in his arrest. The trunk belonged to Dagues, a French Officer, and contained the clothes of three other officers on parole. The attempted escape via Edinburgh and then by boat from Leith was thwarted. Although Feaste was in disguise, the Agent from Kelso saw that he answered the description of a man which had been circulated throughout the country. The suspect was sent to Jedburgh Jail and the Agent contacted London. London didn’t want to know. Indeed, London were not at all grateful. In the end it was left to the Solicitor General to decide what happened next. He decided that Feast should be detained as a deserter from the Navy rather than aiding the escape of prisoners. See also: “They seek him here. They seek him there.” The Whitstable Pimpernel. Part1.